I usually start a novel with at least a working title. Not this time. However, I am starting with a working cover design. You can see a cover template over at the right, for the novel, the next in the Ardor Point series (Ardor Point #2). This is based on the only stock image that I could find that I thought represented the feeling I wanted to communicate. (And you’ll never believe, if you search for “romance sea,” how many beach sunset photos you’ll get.) I found this particular image by looking for young couples on a pier. I may search at more, different sites in hopes of finding another candidate image. Then I can do some market-testing using different cover designs. Most publishers (and even indie and self-publishing authors) put off the cover design until after the manuscript is finished, but by that time there’s not enough time to do any significant market testing of it. 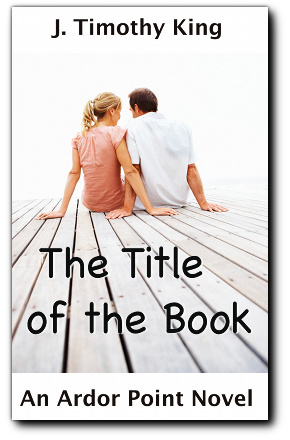 I’ve been trying to choose the title and design the cover earlier in the process, as you can see here. These should be done first (not last), because from a marketing perspective, these make the most difference in getting prospective readers’ attention. Next, I need to come up with a few prospective titles. In order to generate prospective titles, however, I need to know at least what the story will be about. And for this, I need The Sentence (a technique I stole from Holly Lisle’s Think Sideways course). For the time being, I’ve begun writing up character sketches for the main character, Devon Richardson, and her new hubby, David. Yeah, I know. I should have picked names of different lengths that began with different letters—Devon and David and David and Devon… That’s not confusing! But they were minor characters that appeared in From the Ashes of Courage, and now I’m locked into those names. Doh! Lesson learned: When choosing names, even for walk-on characters, consider what would happen if you later want to make them stars of their own novel. Would the names still work? Even so, I’m learning a lot about them, such as that she collects and restores antiques, in order to connect with the past, as replacement for inadequacies in her relationships. Taken to the extreme, which the coming year will do, this bad habit could become a fateful addiction. And unfortunately, there’s no Betty Ford Clinic for Compulsive Antiquers.